Despite ongoing efforts from friends, opponents, and fans to change his mind, Dwyane Wade is sticking to his plan to retire from the NBA at the end of the 2018/19 season. However, that’s not to say he doesn’t believe he could keep playing if he wanted to. Speaking to Shams Charania of The Athletic, Wade said the thinks he could play “a solid two more years,” at least. Wade, who turned 37 in January, set new career lows in minutes and points per game last season, but has reversed that trend this year, averaging 14.3 PPG, 4.0 APG, and 3.8 RPG in 63 games (25.6 MPG) for the Heat. The 13-time All-Star has played particularly well lately as Miami pushes to secure a playoff spot, scoring 15.5 PPG with a .462 FG% and a .340 3PT% over his last 18 games. 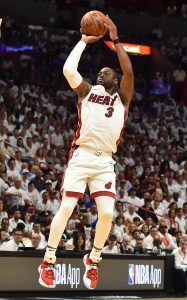 Still, Wade acknowledges that it has been difficult at times to figure out how much he can – and should – do on the court, as he looks to pass the baton to some of his younger teammates. As for his retirement decision, Wade appreciates that many people around him would like to see him keep playing, but is confident that he’s making the right call. Dwyane Wade‘s playing career is coming to an end and the 13-time All-Star would like to own an NBA team. The Heat would be his first choice, though owner Micky Arison has shown no interest in selling, so a minority ownership role appears to be the only available way to own a piece of the team he helped lead to three championships. If Wade joins the franchise in such a role, he would want to be involved in personnel decisions to some extent, as he tells Barry Jackson of the Miami Herald. Wade added that he wouldn’t need to have final say on basketball decisions, telling Jackson that he wouldn’t want to have that “pressure” on him. The three-time NBA champion plans to reach out to Hornets owner Michael Jordan and Lakers president of basketball operations Magic Johnson to discuss life as a professional franchise owner. Wade added that he has spoken with long-time teammate Udonis Haslem about the possibility of being an owner of an NBA club. Haslem is planning to play at least one more season, while Wade is unlikely to join him for it. NBA commissioner Adam Silver spoke out against tanking today in his annual All-Star Weekend address, calling the practice “corrosive,” relays Marc Berman of The New York Post. Silver lives in New York, Berman notes, and has daily exposure to the Knicks, who dropped 18 consecutive games before beating the Hawks on Thursday. The league changed its rules this year to reduce the benefits of having the worst overall record, giving equal odds at the top pick to the three bottom teams. However, the move hasn’t had the desired effect as the Knicks, Suns, Cavaliers and Bulls are far separated from the rest of the NBA in our latest Reverse Standings. The allure of adding a star such as Duke’s Zion Williamson is too tempting, even with the new odds. “I’m pretty sure we acknowledged at the time we didn’t think we’d solve the problem,’’ Silver said, hinting that additional changes may be on the way. Silver admitted that the move to add Dirk Nowitzki and Dwyane Wade to the All-Star Game was suggested by a fan’s email, tweets ESPN’s Tim Bontemps. Michael Jordan is the only former NBA great who currently serves as the majority owner of one of the league’s 30 teams. However, LeBron James – who is often mentioned alongside Jordan in discussions on the league’s all-time best players – would like to join the former Bulls great in the ownership ranks someday. And, as Joe Vardon explains in an interesting piece for The Athletic, James is uniquely positioned to actually make it happen. According to Vardon, if James were to retire today and an NBA franchise went up for sale tomorrow, the four-time MVP would be in position to place a bid, given his net worth, his connections, and the cache he has built up around the league. “Ain’t no maybe about it, I’m going to do that s–t,” James told Vardon, referring to eventually owning an NBA franchise. As Vardon outlines, James doesn’t have “Steve Ballmer money” and couldn’t just write a check to purchase an NBA franchise outright, but a majority owner is only required to purchase 15% of a team’s shares. While LeBron’s estimated net worth is $450MM, per Forbes, that estimate likely undershoots the actual figure, according to Vardon, who notes that James has made a number of private investments and maneuvers in recent years that would push the number higher. With the right group of investors and partners, James would easily be able to put together a group capable of making a strong bid for any franchise that goes up for sale, as LeBron’s business associate Paul Wachter tells Vardon. This is, of course, unlikely to happen anytime soon, as James is in the first season of a four-year contract with the Lakers and is planning to continue playing beyond that deal, per Vardon. However, when the time comes, it sounds like LeBron will be ready, as ESPN’s Brian Windhorst wrote in his own story on the subject earlier this week. Meanwhile, James’ good friend Dwyane Wade is headed for retirement at season’s end, and while Wade isn’t necessarily as well positioned to purchase a franchise, the idea of owning a team intrigues him too, writes Barry Jackson of The Miami Herald. Wade has previously mentioned the appeal of becoming part of an ownership group that would bring the NBA back to Seattle, but told reporters this week that he’s not solely focused on one city. As Jackson observes, Heat majority owner Micky Arison hasn’t shown any interest in selling the club, but he might – hypothetically – be open to selling a small share of the franchise to Wade, who could serve as a minority stakeholder after he retires as a player. As with LeBron though, that’s likely a discussion to be had down the road.